John Shakespeare’s property in Henley Street, inherited by his son William in 1601, and now known as the Birthplace, had a frontage of about 90 feet. When an urban property changed hands, its boundaries were often defined by reference to neighboring properties. Thus in 1575, when William Wedgewood sold the property adjoining the Shakespeare house to the east to Edward Willes of Kings Norton, it was described as bounded on the west by a tenement of John Shakespeare, yeoman. John was also a witness to the 1575 deed. 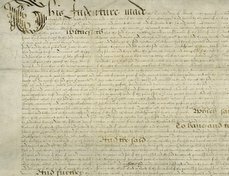 In July 1609, Edward Willes (perhaps the succesor in title to the Edward of 1575 rather than the same man) conveyed the same property to trustees to hold for his benefit for life and then for his kinsman, another Edward Willes, of Handsworth. At that point, the property was an inn known as the Bell in the tenure of Robert Brooks. The building to the property’s west, in 1575 held by John Shakespeare, was now described as “late of William Shake-spere.” This was not an accurate description, as William Shakespeare was certainly still the freeholder (or owner) of the property when he made his will in 1616. 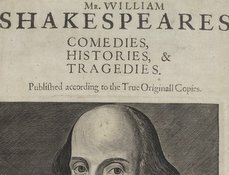 Although Shakespeare was still alive, the statement that it was “late” his property probably arose from the fact that, since around 1601, and possibly earlier, it had been held under a long lease to Lewis Hiccocks. The lease was for 63 years, as recorded in Hiccocks’ inventory after his death in 1627 (Stratford-upon-Avon Inventories, ii, p. 16). 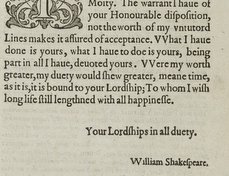 However, there was clearly uncertainty in 1609-- the word “late” was inserted afterwards, as was the word “Robert” in the line above, suggesting that the wording was only finalized after enquiries had been made. 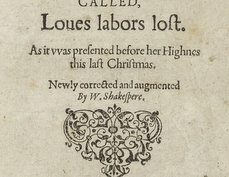 In 1613, when a further deed was drawn up affecting the house on the east, the adjoining Shakespeare property was described unequivocally as “late of William Shakespere.” By that time, his interest may well have appeared even more marginal.